I awoke and thought I was in heaven. I felt at peace. My head was clear after a nights sleep free from The Hum. A perfect symphony of bird calls rang out from the bush. There were no screeching divas with the absence of magpies, wattle birds, crows, seagulls and corellas. The subtle call of the Gang Gang Cockatoos could be heard. It has a quieter squawk than its cockatoo cousins. It is more of a croak. We had seen three Gang Gangs the day before. They are distinguished by their grey feathers and red crests. I had slept well in the tent despite frequent interruptions from snarling possums fossicking about for food and the occasional wallaby bounding by. The Glenelg River in south west Victoria is beautiful. Surrounded by Australian bushland, it is protected by its National Park status, amid the ugly pine plantations that go on for kilometers and spoil this environment. 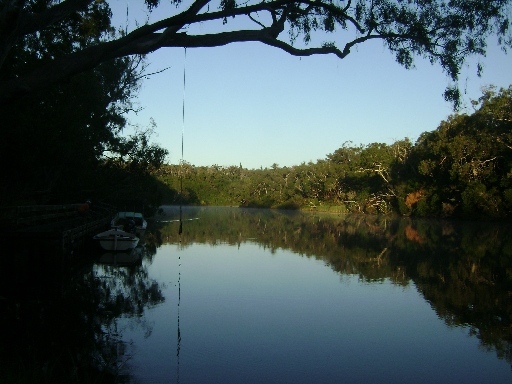 The river is large enough for power boats, but favoured by canoeists and kayakers. There are no rapids but a swift current moves the slightly salty water to the estuary downstream at Nelson. Bream are often caught by the fishermen who frequent this place. We swam, dived and jumped off jetties, fished, sat, cruised in the boat, cooked at the campfire, and looked for satellites and meteors in the star filled sky. The next day we left the clear hot day behind and descended into the cool dark underground interior of the Princess Margaret Rose Cave to be amazed by the stalactites and stalagmites. This entry was posted in Uncategorized and tagged Australia, birds, camping, Gang Gang cockatoo, Glenelg River, wildlife by suesbent. Bookmark the permalink.